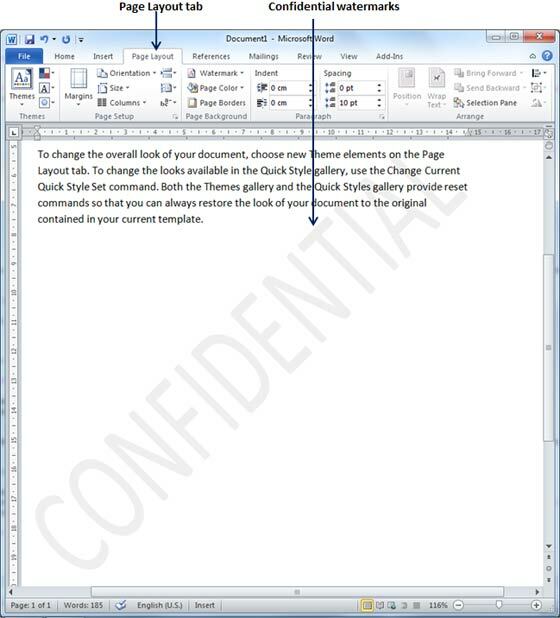 A watermark is a picture that shows up faintly behind the text on a word document page. When you drafting a document, you can watermark the document with Draft Copy stamp, or you can watermark a duplicate document with Duplicate stamp. Microsoft Word allows you to stamp with watermark using simple steps explained in this chapter. 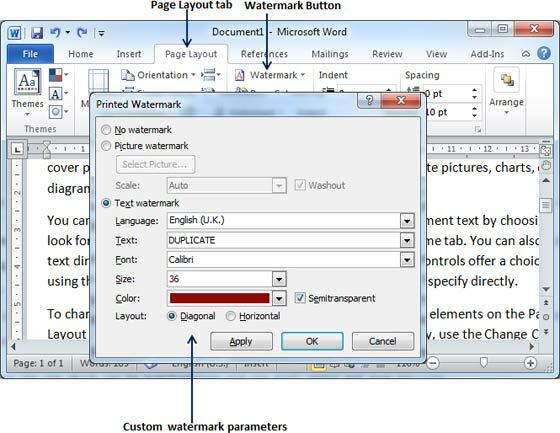 Following are the simple steps to set standard watermark in word document. A standard watermark is the one which is already defined by words and can not modify their font or color etc. 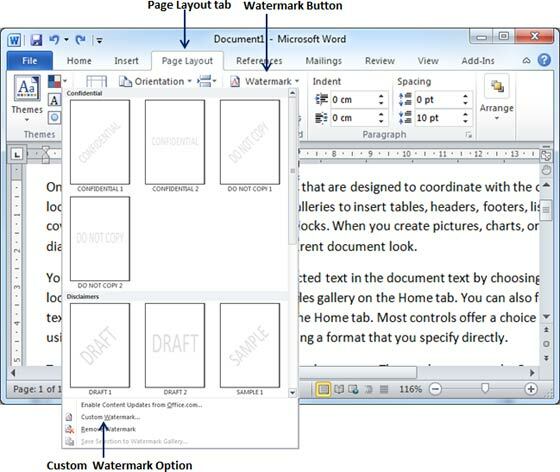 Step (1): Open a word document in which you want to add a watermark. Step (2): Click the Page Layout tab and then click Watermark button to display a list of standard watermark options. Step (3): You can select any of the available standard watermarks by simply clicking over it. This will be applied to all the pages of the word. Assume we select Confidential watermark. 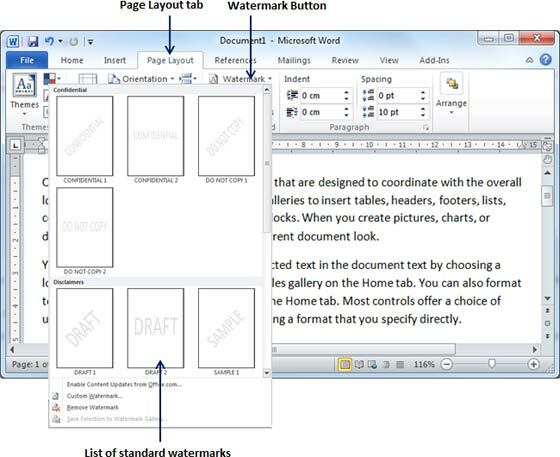 Following are the simple steps to set custom watermark in word document. A custom watermark is the one which can be modified text and its font, color and size etc. Step (2): Click the Page Layout tab and then click Watermark button to display a list of standard watermark options. At the bottom you will find Custom Watermark option. Step (3): Click over the Custom Watermark option which will display Printed Watermark dialog box. Step (4): Now you can set a picture as watermark or you can set predefined text as watermark or you can type your text in Text box available at Printed Watermark dialog box. We will set text watermark as DUPLICATE and set its font color and font size. Once all the parameters are set, click OK button to set the parameters. 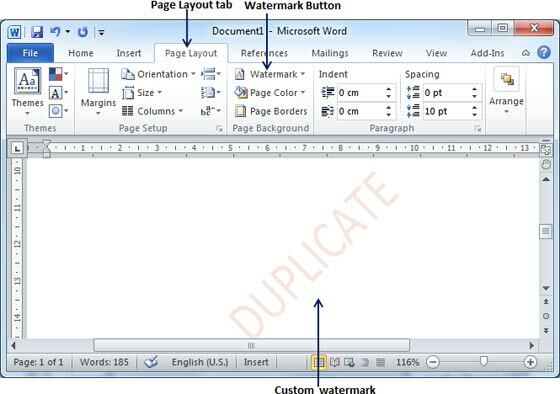 Following are the simple steps to remove an existing watermark from a word document. 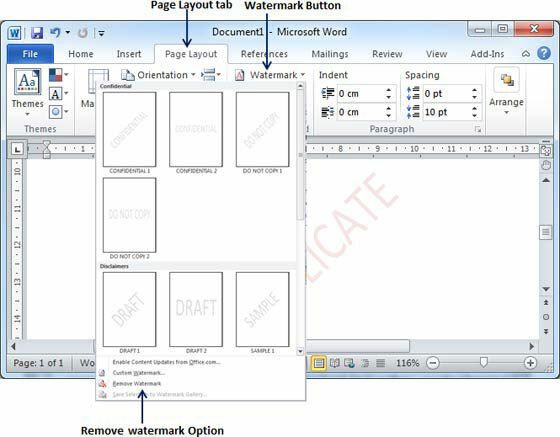 Step (1): Open a word document from which you want to delete a watermark. Step (2): Click the Page Layout tab and then click Watermark button to display a list of standard watermark options. At the bottom you will find Remove Watermark option. Step (3): Click Remove Watermark option which will delete existing watermark from the document.